HMD Global has confirmed it will be holding a launch event on May 29. Earlier today the Finland-based manufacturer launched the highly-anticipated Nokia X6 as a China exclusive, but it appears the company’s next event will focus on its international consumers. 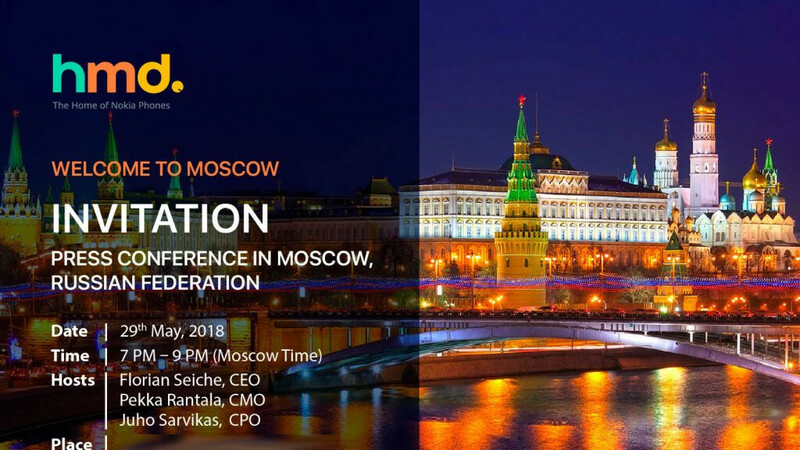 After all, come May 29, HMD Global will be holding a large media event in Moscow, Russia. The event itself will be held between 7 PM and 9 PM local time and will see three major executives in attendance. Specifically, the manufacturer’s CEO, CMO, and CPO will all be present, suggesting major product launches could be on the horizon. So far this year, the Nokia 1, Nokia 6 (2018), Nokia 7 Plus, and Nokia 8 Sirocco have all been launched. However, 2018 editions of the Nokia 2 and 3 are expected to arrive sometime this year. Furthermore, one HMD Global executive also recently teased the impending launch of the Nokia 5 (2018), which could mean it could be making an official appearance at the event. In addition to all of this, recent rumors point towards an international Nokia X line of devices. Despite the fact that the new Nokia X6 is a China-exclusive, HMD Global is reportedly preparing two new offerings for international markets, dubbed the Nokia X5 and Nokia X7, both of which could make an appearance in Russia. Ultimately, HMD Global is unlikely to confirm what exactly will be announced on May 29. However, considering last year’s Nokia 3 went on sale in June and the popular Nokia 5 arrived in July, successors to these two smartphones seem like the most likely candidates for the event. When it comes to the 2018 edition of the Nokia 2, though, it may be a bit too early. After all, the original Nokia 2 went on sale just six months ago. How many of these phones are they going to crank out? As many as possible! But we need high end one! I just need them to crank out one for the USA that's not the lower-end range. A nice mid-range to high-end would be nice. The Nokia 7 Plus didn't come here unfortunately -___- . I want the Nokia 9. Lumia 1020 successor is all I care about. It's bad enough they let Huawei do it while they continue to churn out entry to mid-range devices. Just give us the goods please. Absolutely . I have been waiting for 5 years now and Nokia 1020 does not have any successor. I still own 1020, but it has its own limitations. God knows when will Nokia launch a 1020 successor flagship. Thr next Ngage is all the successor I'm waiting for. What about the Nokia N series Models they teased about?I also heard they will relaunch the C series separately after model X5/7 this year or next year if its X series get succesful with N series too.Pentalens Camera Flagship Device is missing too.HMD seem to using the strategy of old Nokia to bring back Old series names into today android realm of modern smartphones and gagets choices. HMD is following the Nokia of old’s method of cranking out smartphones (at least for mid and low end). It worked for them, and is obviously working for HMD. They’ve got the resources and scale to do it, and if it’s working, why stop? Now we are just waiting for a truly high end Nokia branded handset from Nokia, which I know is going to be amazing. Nokia branded handsets from HMD has propelled them into the top 10 globally. Keep up the amazing work, HMD. Looking forward to this event. As long as they can keep up with updating the phones on time, then they can just keep churning them out. The seem to be currently doing just fine with updates. They're doing a much better job than another company trying to make a comeback. They have yet to get past Nougat and Marshmallow. Security updates are only half of the package. Exactly. HMD is doing better than most with full OS updates, and is flat out awesome with the security updates. Both them and BlackBerry have even beaten Google to the punch with their monthly security updates at times, and they pack in features in their monthly security updates that Google doesn’t put in theirs. IMO, monthly security updates are more important than full OS updates, since you can be on the most current full OS and be way behind on security updates. What works in the company of old won't necessarily work now otherwise the old company would still be around. You don't want to dilute your brand before you even get the ball rolling. Hopefully HMD releases a high end phone that is usable by everyone. An HMD Pixel would be a great idea. Why not make the best of the best? Can’t say enough how HMD is banging out smartphones for all segments, and they are selling. They are currently a top 10 global OEM, and their market share is still growing. They are gong to be around for a long time to come, especially if they stick to banging out quality Nokia branded smartphones (which have been selling more than other big names like the Google Pixel line, for example), and make them GSM unlocked so they will be future proof and can be used all over the world.